BACKGROUND: Rumex species are traditionally used for the treatment of neurological disorders including headache, migraine, depression, paralysis etc. Several species have been scientifically validated for antioxidant and anticholinestrase potentials. This study aims to investigate Rumex hastatus D. Don crude methanolic extract, subsequent fractions, saponins and flavonoids for acetylcholinestrase, butyrylcholinestrase inhibition and diverse antioxidant activities to validate its folkloric uses in neurological disorders. Rumexhastatus crude methanolic extract (Rh. Cr), subsequent fractions; n-hexane (Rh. Hex), chloroform (Rh. Chf), ethyl acetate (Rh. EtAc), aqueous fraction (Rh. Aq), crude saponins (Rh. Sp) and flavonoids (Rh. Fl) were investigated against acetylcholinesterase (AChE) and butyrylcholinesterase (BChE) at various concentrations (125, 250, 500,1000 μg/mL) using Ellman's spectrophotometric analysis. Antioxidant potentials of Rh. Sp and Rh. Fl were evaluated using DPPH, H2O2 and ABTS free radical scavenging assays at 62.5, 125, 250, 500, 1000 μg/mL. RESULTS: All the test samples showed concentration dependent cholinesterase inhibition and radicals scavenging activity. The AChE inhibition potential of Rh. Sp and Rh. Fl were most prominent i.e., 81.67 ± 0.88 and 91.62 ± 1.67 at highest concentration with IC50 135 and 20 μg/mL respectively. All the subsequent fractions exhibited moderate to high AChE inhibition i.e., Rh. Cr, Rh. Hex, Rh. Chf, Rh. EtAc and Rh. Aq showed IC50 218, 1420, 75, 115 and 1210 μg/mL respectively. Similarly, against BChE various plant extracts i.e., Rh. Sp, Rh. Fl, Rh. Cr, Rh. Hex, Rh. Chf, Rh. EtAc and Rh. Aq resulted IC50 165,175, 265, 890, 92, 115 and 220 μg/mL respectively. In DPPH free radical scavenging assay, Rh. Sp and Rh. 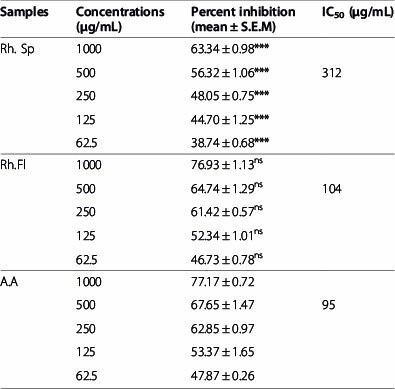 Fl showed comparable results with the positive control i.e., 63.34 ± 0.98 and 76.93 ± 1.13% scavenging at 1 mg/mL concentration (IC50 312 and 104 μg/mL) respectively. The percent ABTS radical scavenging potential exhibited by Rh. Sp and Rh. Fl (1000 μg/mL) were 82.58 ± 0.52 and 88.25 ± 0.67 with IC50 18 and 9 μg/mL respectively. Similarly in H2O2 scavenging assay, the Rh. Sp and Rh. Fl exhibited IC50 175 and 275 μg/mL respectively. CONCLUSION: The strong anticholinesterase and antioxidant activities of Rh. Sp, Rh. Fl and various fractions of R. hastatus support the purported ethnomedicinal uses and recommend R. hastatus as a possible remedy for the treatment of AD and neurodegenerative disorders. According to WHO report 2001, round the world 25% individuals suffer from mental/neurological disorders in their life time . The most common neurological disorders are epilepsy, headache, migraine, susto (fright), madness, numbness, insomnia, stress, depression, alzeimer's disease, parkinson's disease, anxiety etc [2,3]. In developed countries the treatment of these diseases is achieved by proper preventative measures, rehabilitation and improved monitoring of patients. But in developing and underdeveloped countries, the patients suffering from different diseases primarily rely on traditional practitioners and herbal medicine. The traditional use of herbal medicine is as old as the history of man. Even today the herbal medicine is utilized in sizable portion of world's population. As far as the use of traditional medicine for the neurological diseases are concerned, the scientific validation of various medicinal plants supports their traditional uses and have led to development of novel drugs [4,5]. Large numbers of natural bioactive compounds have been derived from various plants species based on their traditional knowledge. For example the Ginkgo biloba was traditionally perceived as memory enhancer and was considered as anti-ageing which was scientifically verified but later on it was also confirmed that it is effective in the treatment of mild to moderate alzeimer's disease [6-8]. Similarly galanthamine a drug used against AD that is derived from Galanthus nivalis is also the outcome of traditional knowledge. It has been reported in detail that Galanthamine basically increases acetylcholine level in synapsis by inhibiting the acetylcholinesterase responsible for the breakdown of acetylcholine. AD occurs as a result of decreased cholinergic transmission, increased oxidative stress, increased inflammatory condition, increased β-amyloid formation, decreased nerve growth factors etc . But for the treatment of AD only cholinesterase inhibitors are considered primarily. The other factors responsible for AD are not emphasized as the cholinergic transmission, yet they are having ample importance. The ethnomedicinal uses of flora make it easy to know the latent potentials of a specific plant specie. R. hastatus, one of the members of polygonaceae has wide variety of traditional uses, for examples, it is commonly used as laxative, alterative, tonic, in rheumatism , in skin diseases, piles, bilious complaints and lungs bleeding . The juice of R. hastatus is used to treat blood pressure , in tonsillitis and sore throat , as flavoring agent, carminative and diuretic . Similarly it has also been reported to be used traditionally against giddiness and insanity . As far as other species of Rumex are concerned, majority of them are traditionally being used for various neurological disorders i.e., R. acetosa is traditionally used in paralysis , R. abyssinicus is used for the treatment of migraine, headache, rabies , R. tuberosus is used as tension regulator  and R. nepalensis, R. maderensis are also used in headache [19,20]. Moreover the R. patientia has been scientifically confirmed to improve memory and passive avoidance learning . Antioxidant activities of several species of Rumex have been reported while the anticholinesterase activities are still to be scientifically confirmed [22,23]. Almost all the species of a specific genus resembles considerably due to genome similarity among the species of the same genus . As discussed earlier, the species of Rumex are traditionally being used in paralysis, headache and other CNS disorders so it provide an ethnomedicinal evidence for the presence of cholinergic transmission enhancing principles in this genus. Based on the previous literature and ethnomedicinal uses, this investigational study is designed to uncover the anticholinesterase and antioxidant potentials of various samples of R. hastatus and to provide a bridge between the traditional and scientific knowledge. The preliminary phytochemical screening of R. hastatus confirmed the presence of alkaloids, saponins, anthraquinone glycoside, tannins and flavonoids. The extraction yield of Rh. Sp and Rh. Fl of R. hastatus was 6.5 and 8% respectively. The most prominent AChE inhibition of various samples of R. hastatus was recorded for Rh. Sp and Rh. Fl. The percent AChE inhibition observed for Rh. 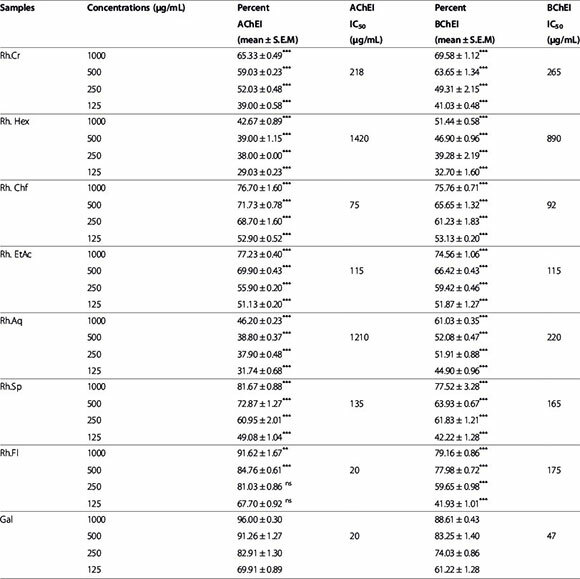 Sp were 81.67 ± 0.88, 72.87 ± 1.27, 60.95 ± 2.01 and 49.08 ± 1.04 at the concentration of 1000, 500, 250 and 125 μg/mL respectively with IC50135 μg/mL, while the Rh. Fl displayed 91.62 ± 1.67, 84.76 ± 0.61, 81.03 ± 0.86 and 67.70 ± 0.92% AChE inhibition at afore mentioned concentrations with IC50 20 μg/mL. Among the resultant fractions the Rh. Chf revealed good results as shown in Table 1. All the fractions showed concentration dependent activity. The IC50 calculated for Rh. Cr, Rh. Hex, Rh. Chf, Rh. EtAc and Rh. Aq were 218, 1420, 75, 115 and 1210 μg/mL respectively, in which Rh. Chf was observed as most potent. Data is represented as mean ± S.E.M; n = 3, * represent level of significance like; * = P < 0.05, ** = P < 0.01, *** = P < 0.001. In BChE inhibition assay, Rh. Fl and Rh. Sp excelled among all the test samples. The percent BChE inhibition calculated for Rh. Sp were 77.52 ± 3.28, 63.93 ± 0.67, 61.83 ± 1.21 and 42.22 ± 1.28 at 1000, 500, 250 and 125 μg/mL respectively with IC50 165 μg/mL. Rh. Fl displayed 79.16 ± 0.86, 77.98 ± 0.72, 59.65 ± 0.98 and 41.93 ± 1.01% BChE inhibition at afore mentioned concentrations with IC50 175 μg/mL. Similarly all the fractions showed moderate to high activity and the IC50 calculatedforRh.Cr,Rh.Hex,Rh.Chf,Rh.EtAcand Rh. Aq were 265, 890, 92, 115 and 220 μg/mL respectively against BChE as shown in the Table 1. Briefly the BChE inhibition observed for each plant samples were dose dependent and the results of Rh. Fl and Rh. Sp were almost comparable with the positive control. The antioxidant activity of Rh. Sp and Rh. Fl against DPPH free radicals displayed a dose dependent response. The DPPH scavenging potential of Rh. Fl was comparable with ascorbic acid while the Rh. Sp displayed a moderate antioxidant activity in comparison with the positive control. The percent radical scavenging potentials of Rh. Sp were 63.34 ± 0.98, 56.32 ± 1.06, 48.05 ± 0.75, 44.70 ± 1.25 and 38.74 ±0.68 at the concentrations of 1000, 500, 250, 125 and 62.5 μg/mL respectively with IC50 312 μg/ mL. The Rh. Fl demonstrated 76.93 ± 1.13, 64.74 ± 1.29, 61.42 ±0.57, 52.34 ±1.01 and 46.73 ± 0.78% radicals scavenging potentials at 1000, 500, 250,125 and 62.5 μg/mL respectively with IC50 104 μg/mL as shown in the Table 2. Data is represented as mean ± S.E.M; n = 3. * represent level of significance like; * = P < 0.05, ** = P < 0.01, *** = P < 0.001. The antioxidant activity of R. hastatus against hydrogen peroxide revealed good results for Rh. Sp. The Rh. Fl demonstrated good antioxidant activity with IC50 275 μg/mL, which was comparable with the positive control. The percent hydrogen peroxide scavenging potentials exhibited by Rh. Sp were 29.13 ± 0.20, 37.85 ± 0.97, 44.82 ± 0.82, 56.90 ± 0.78 and 65.70 ± 1.25 at the concentrations of 62.5, 125, 250, 500 and 1000 μg/mL respectively with the IC50 of 175 μg/mL. At the highest concentration, i.e., 1000 μg/mL the Rh. Fl and positive control exhibited 54.34 ± 1.01 and 54.17 ± 1.69% inhibitions respectively while the Rh. Sp demonstrated 65.70 ± 1.25% antioxidant potentials as shown in Figure 1. 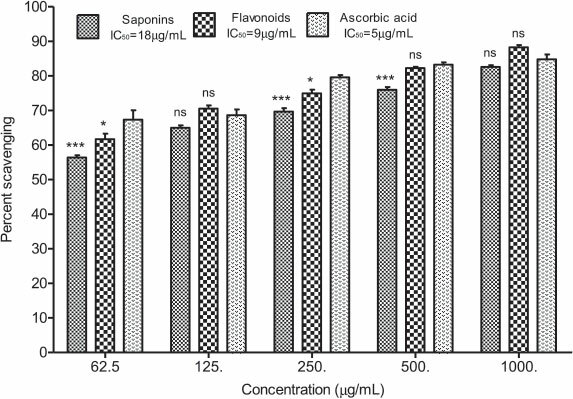 Figure 1 Percent H2O2 scavenging effect of flavonoids and saponins of Rumex hastatus along with ascorbic acid at various concentrations. Data is represented as mean ± S.E.M. The ABTS radical scavenging activity of Rh. Sp and Rh. Fl of R. hastatus was more prominent in comparison to other antioxidant assays. Both the plant samples exhibited very low IC50values in this activity. The Rh. Fl displayed 88.25 ± 0.67, 82.23 ± 0.39, 74.92 ± 1.08, 70.53 ± 0.90 and 61.70 ± 1.60% ABTS radical scavenging potential at the concentrations of 1000, 500, 250, 125 and 62.5 μg/mL respectively with the IC50 of 9 μg/mL. The Rh. 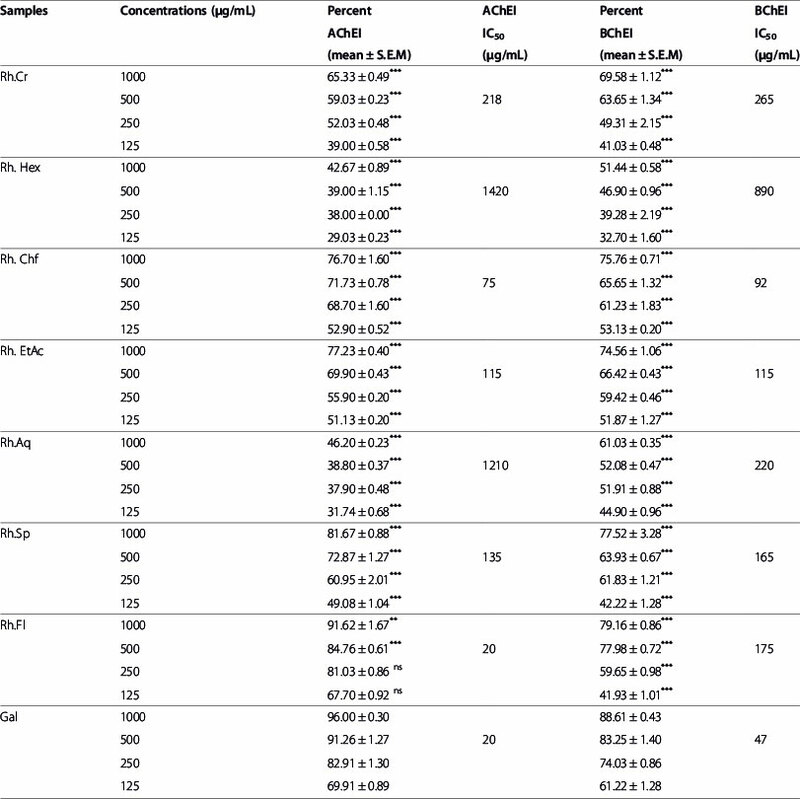 Sp showed the IC50 value of 18 μg/mL, which was larger (less potent) than those of Rh. Fl (IC50 = 9 μg/mL) and positive control (IC50 = 5 μg/mL). Briefly the ABTS radical scavenging activity of samples of R. hastatus revealed remarkable results with dose dependent response as shown in the Figure 2. 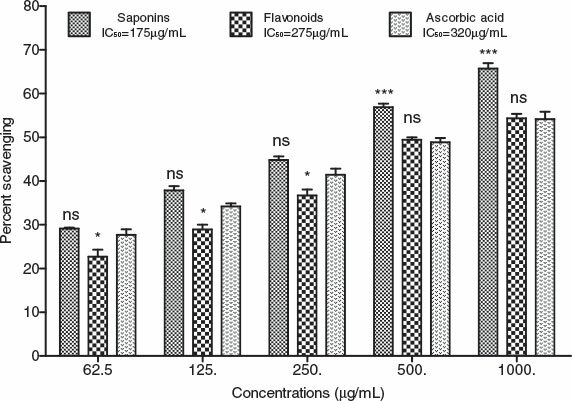 Figure 2 Percent ABTS radical scavenging effect of flavonoids and saponins of Rumex hastatus along with ascorbic acid at various concentrations. Data is represented as mean ± S.E.M. Acetylcholine, an extensively distributed neurotransmitter especially in the central nervous system has a key role in transmission of signal across the synapses, cerebral blood flow, cognitive performance and coordination. The decreased level of acetylcholine within the nervous system of the body may be due to reduced acetyltransferase or increased level of AChE. These two factors are correlated with dementia and AD. The hydrolysis of acetylcholine is decreased by inhibiting AChE in the brain [25,26]. There are numerous evidences which support the deteriorating action of free radicals, which can lead to cognitive ageing and CNS disorders . The age related brain performance can be easily ameliorated by the consumption of fruits and vegetables rich in flavonoids, which possess the ability to neutralize the free radicals . It has already been reported that the cognitive performance can be significantly improved by taking diet rich in antioxidant species especially the flavonoids [29,30]. It is believed that the natural products are safe as compared to synthetic compounds . Due to great interest towards the natural products, the scientists are trying to investigate more and more plants for the presence of effective compounds, which may cure a specific disease. The presence of thousands of flavonoids has been confirmed in more than 3000 plant species. Flavonoids have been reported to be significantly effective in cholinesterase inhibition, i.e., Leufolins A and B (flavonoids) isolated from Leucas urticifolia have been scientifically verified to possess strong BChE inhibitory potential . It is also obvious of our current investigations that Rh.Fl possess comparable anticholinesterase potential with the positive control (galantamine). Similarly the saponins are also prominent secondary metabolites, which have been verified to possess various beneficial pharmacological potentials. For instant, the saponins isolated from traditional Chinese medicines have demonstrated excellent antioxidant activity . As obvious of the current investigational data, the Rh.Sp demonstrated good antioxidant and significant anticholinesterase potential. Similarly the antioxidant potential of Rh.Sp against ABTS was comparable to the positive control and Rh.Fl as shown in the Figure 2. The current investigation and the literature review intimates the presence of anticholinesterase compounds in Rh.Sp and Rh.Fl of R. hastatus just like the saponins (Bacosides) of Bacopa monnieri and the flavonoids (ginkgoflavonglycosides) of Ginkgo biloba . Among the subsequent fractions the excellent activity of Rh.Chf and Rh.EtAc represents that the saponins and flavonoids may be concentrated in the said fractions. The previously reported data also goes parallel with our current investigation i.e., in the current study the Rh.Fl has shown significant antioxidant potential and in the previous reports, the fractions (chloroform, ethyl acetate and butonal) having high quantity of total phenolics and total flavonoids content had shown significant antioxidant activity as reported by Sehreen et al and Afzal et al [35,36]. Likewise several other plant species have been reported to possess multiple pharmacological activities [37-39]. The thorough literature survey and the results of our current investigation support the potential role of R. hastatus in the treatment of nervous disorders. Similarly, based on the significant enzymes (AChE, BChE) inhibition and radicals scavenging demonstrations of various samples of R. hastatus, it may be inferred that the Rh. Fl and Rh. Sp of R. hastatus may be the best sources of antioxidant and anticholinesterase compounds. The bioguided isolation of R. hastatus is in progress in our laboratory, which may lead to new anti-Alzheimer's disease and antiageing candidates. The whole plant of R. hastatus was collected from the hilly area of Gorha Gat nearby University of Malakand, Chakdara (Lower dir) KPK, Pakistan. The plant was identified by plant taxonomist Ali Hazrat and deposited with voucher number (1015SJ) in the herbarium, Department of Botany, Shaheed Benazir Bhutto University, Sheringal (Dir Upper) KPK, Pakistan. All the extra particles (sand and dust) were thoroughly removed from the plant and was scattered on neat paper in a room protected from sunlight and properly shade dried for 20 days. The paper was changed every day to avoid fungal growth. After shade drying the plant material was converted into coarse particles using cutter mill. The powdered plant sample (4 kg approximately) was subjected to maceration in 80% methanol and filtered after 15 days using muslin cloth. The filtrate was concentrated using rotary evaporator and then solidified using water bath at 40°C yielding 300 g of crude methanolic extract. The crude methanolic extract obtained (260 g) was subject to fractionation using successive solvent-solvent extraction process starting from n-hexane, chloroform, ethyl acetate and water yielding 30, 22, 53 and 140 g of Rh. Hex, Rh. Chf, Rh. EtAc and Rh. Aq respectively . For the extraction of Rh. Sp from R. hastatus, 20 g powdered plant was added to 100mL ethanol (20%). The sample was heated at 55°C in water bath for four hours with continuous stirring. After four hours the sample obtained was filtered and the residue having greenish color was re-extracted with 200 mL of 20% ethanol. The sample after extraction was heated until a concentrated volume of 40 mL was obtained. Then it was transferred into a separating funnel and 20 mL of diethyl ether was added to it. After vigorous shaking, the separating funnel was put in a stand to get two layered sample. The lower layer was collected, which was aqueous layer while the upper diethyl ether layer was discarded. The aqueous layer obtained was diluted with 60 mL of n-butanol and the combined n-butanol extract was washed with 10 mL of 5% sodium chloride solution. The final solution obtained was kept in a hot water bath until complete evaporation and the Rh. Sp obtained were dried in an oven yielding 1.3 g of Rh. Sp . For the extraction of flavonoids from R. hastatus, the procedure of Harborne was followed . Powdered plant sample weighing 20 g was heated at 50°C in 200 mL of 2M HCl under reflux for half an hour. It was cooled and filtered using whatman No.42 filter paper. The filtrate was treated with equal volume of ethyl acetate. The Rh.Fl present in the extract were precipitated, which were recovered with the help of weighed filter paper. The weight of Rh.Fl obtained was 1.6 g (8%) . The preliminary phytochemical screening of the R. hastatus was carried out to determine the existence of alkaloids, saponins, anthraquinone glycoside, tannins and flavonoids . Electric eel acetylcholinesterase (type-VI-S, Sigma-Aldrich USA), Aquine butyrylcholinesterase (Sigma-Aldrich USA), Acetylthiocholine Iodide (Sigma-Aldrich UK), Butyrylthiocholin iodide (Sigma-Aldrich Switzerland), 5,5-dithio-bis-nitrobenzoic acid (DTNB) (Sigma-Aldrich Germany), Potassium phosphate buffer (pH 8.0), Galantamine from Lycoris Sp. (Sigma-Aldrich France). AChE and BChE inhibition was assessed spectrophoto-metrically for Rh. Fl and Rh. Sp using Acetylthiocholine iodide and Butyrylthiocholine iodide as substrate following the method of Ellman . In this method, 5 μLofAChE (0.03 U/mL) and BChE (0.01 U/mL) were taken inacuvette and205 μL of plant samples (125-1000 μg/mL) were added to them. DTNB (5 μL) was added to the mixture, transferred to a water bath having temperature of 30°C and incubated for 15 minutes. Substrates having volume of 5 μL were added to the mixture to start the reaction. The reaction mixture was analyzed at 412 nm using a double beam spectrophotometer. Absorption was recorded for 4 minutes. The formation of yellow color indicated the formation of 5-thio-2-nitrobenzoate anion as a result of the reaction between thiocholines and DTNB. To check the non-enzymatic hydrolysis of substrate, white assay was carried out without enzymes and plant samples. The reaction mixture containing all the components excluding plant sample was taken as control. Percent enzyme activity and percent inhibition were figured out as follows. (Where V denotes rate of reaction in the present of inhibitor and Vmax denotes rate of reaction without inhibitor). Concentrations of test samples, which inhibited substrate hydrolysis (AChE and BChE) by 50% (IC50). Radical scavenging activity was determined by a linear regression analysis among the percent inhibition against the test samples concentrations via MS Excel program. All the tests were performed in triplicate and values were expressed as means ± S.E.M. Significance between radical scavenging activity and test samples were analyzed using Mann-Whitney U test. Group comparison was performed by Student's t-test in which the P < 0.05 were considered significant. SA and MA carried out experimental work, data collection and evaluation, literature search and manuscript preparation. FU, AS and MI refined the manuscript for publication. All authors read and approved the final manuscript for publication. The author is grateful to the taxonomist for the identification of plant species and the head of Department of Pharmacy for the accomplishment of these activities. The authors conducted the whole activities on their own behalf and no funding body was involved in the financial support of these activities.